This unit examines the relations between Chief Joseph and the United States government during the Treaty Era. The level one newsletter introduces students to Chief Joseph and the Nez Perce struggle to keep their homelands intact. Level one includes a newsletter and response questions. In Level Two, students will use Chief Joseph’s “An Indian’s View of Indian Affairs” to explore the history of the Nez Perce from first contact through Chief Joseph’s placement on a reservation in Eastern Washington, and compare maps of the tribal homelands of the Nez Perce and their allocated reservations in Idaho and Oklahoma. Students will then create a story board illustrating their understanding of significant events in the struggles between the Nez Perce and the US Government. In level three, students will use primary sources and other writings to explore the causes of conflict between the Nez Perce and the United States government regarding attempts to place the Nez Perce on reservation lands. Students will use their research to complete the Causes of Conflict CBA. In the time of American expansion following the Civil War, perhaps no story is as indicative of the fractured relationship between Indian Tribes and the United States Government as that of Chief Joseph’s (In-mut-too-yah-lat-lat) campaign against a hostile US Government which ended in the loss of most of the Nez Perce’s land. The Nez Perce, or Nemi’ipuu, had a long, and relatively constructive, history with white people dating to their first interactions with French traders in the early 1700’s. The name Nez Perce originated because the French were unable to speak with the Nez Perce, but identified the tribe by using a sign to indicate the Nemi’ipuu’s pierced noses – Nez Perce in French, and the name remained. Later, Lewis and Clark came upon the Nez Perce when they stumbled out of the Bitterroot Mountains, barely alive, on their journey to the Pacific Ocean. The Nez Perce had an opportunity to easily dispose of the expedition, yet they instead showed Lewis and Clark great hospitality. Members of the expedition commented on the friendliness of the tribe towards them. With continued American settlement of the Oregon Territory, relations between whites and the Nez Perce became strained. According to Chief Joseph, Governor Stevens held a council with the Nez Perce chiefs and declared the need for land to be divided to separate the new white settlers from the Indian people. Stevens said that the Indians must remain on the land designated for them. Many of the chiefs signed this agreement – Chief Joseph’s father, Old Joseph, also a Chief, did not acquiesce. However, in 1855 Chief Joseph’s father, along with other Nez Perce Chiefs, signed the Treaty of Walla Walla preserving most Nez Perce land. While receiving assurances that whites would respect the terms of the treaty, Old Joseph continued to believe that Nez Perce land would not be protected from the seemingly unending stream of white settlers. Chief Joseph’s father was proven right in the 1860’s when gold was discovered on Nez Perce land. Streams of settlers rushed to claim their piece of the fortune and the US Government moved to reduce the size of Nez Perce lands from approximately 5,000 square miles to barely 500 square miles. The Nez Perce continued to fight an uphill battle to preserve their lands against encroachment by whites. Tired and defeated, Old Joseph told his son upon his death bed, “This country holds your father’s body. Never sell the bones of your father and mother.” The Nez Perce became entangled in the continued expansion of US Settlement in the West. In 1877 Nez Perce Indians were told by General Oliver Howard that within 30 days they must all relocate from their beautiful lands in the Willowa valley in Oregon to the Lapwai reservation, in Idaho, where a portion of the Nez Perce already resided. Some Nez Perce, angered by this development, attacked and killed a number of white settlers. The United States Army, in retaliation, attacked a Nez Perce encampment. 1. When did the Nez Perce first encounter Europeans? What European group did the Nez Perce first encounter? 2. What is the actual name of the Nez Perce? Why do we refer to them as the Nez Perce instead? 3. What famous American explorers established friendly relations with the Nez Perce? 4. What instructions did Washington Governor Stevens give to the Nez Perce regarding travel? 5. What discovery led to the US Government reducing the Nez Perce reservation from 5,000 square miles to less than 500 square miles? 6. Why was the Nez Perce escape from US soldiers so remarkable? 7. To what location(s) were the Nez Perce sent following their surrender? What happened to many Nez Perce when forced onto the reservation in Oklahoma? 8. Why is Chief Joseph such a well respected figure in our history? Level Two: In level two students will examine the loss of Nez Perce lands through the eyes of Chief Joseph. Using maps, and primary source materials from the time, including the eloquent words of Chief Joseph, students will examine the story of the Nez Perce struggleto remain sovereign in the face of unyielding pressure from the United States government. 3.1.2 Understands and analyzes physical and cultural characteristics of places and regions in the United States from the past or in the present. There are a number of ways to connect the story of the Nez Perce to that of other Washington Tribes. The story of the Nez Perce once again hits a common note in the history of relations between Indian nations and the US government. Many local tribes will have their own stories about the broken promises of the US government and resistance to the placing of their people on reservations. Indeed some, like the Walla Walla, share history with the Nez Perce through their common location and history. Invite local tribal members in to your classroom to discuss their tribe’s interactions with the US government during the treaty era. Ask your local tribes archivist or other appropriate sources to locate any information about treaties and reservation boundaries brokered during the treaty era. Use Chief Joseph’s “An Indian’s View of Indian Affairs” to explore the history of the Nez Perce from first contact through Chief Joseph’s placement on a reservation in Eastern Washington. Students will pay special attention to the erosion of the Nez Perce’s sovereignty over Chief Joseph’s lifetime. Compare maps of the tribal homelands of the Nez Perce and their allocated reservations in Idaho and Oklahoma. Use “An Indian’s View of Indian Affairs” to create a story board illustrating their understanding of significant events in the struggles between the Nez Perce and the US Government. 1. Where did the Nez Perce live prior to their containment on reservations? 2. Where were Nez Perce reservations? 3. How much land did the Nez Perce lose when placed on reservation lands? 4. Imagine your room shrunk to one tenth its current size – how do you think you would react? These questions are meant to get students thinking about how the Nez Perce must have felt when experiencing the constant eroding of their homelands, natural resources, and hunting and fishing grounds. Students should notice the drastic reduction from the Nez Perce’s historic homelands, to the 1855 reservation border, the 1863 reservation border and, finally, the Nez Perce reservation lands in Oklahoma shown in 1885. Once you have discussed the territory maps, have students read the newsletter Relations between Chief Joseph and the United States Government during the Treaty Era and answer the accompanying questions to check for understanding. Discuss student answers as a group. Reader – This student will be responsible for reading the document out loud to the group. This is a lengthy document so make sure that a strong reader is given this task. Recorder – This student will be responsible for writing down important information from the reading that will be used by the group to create their timeline of events. Story Board Artist – This student will be responsible for designing your groups story board with collaboration from the group. Time keeper – This student makes sure that all tasks are completed in a timely manner and helps keep the group focused and on task. Pass out the grading rubric and a copy of Chief Joseph’s An Indian’s View of Indian Affairs to each student. Tell students that this article was published in North American Review to be read by an American audience in 1879. It was written by Chief Joseph two years after he had surrendered to the United States government following a brilliant military retreat from US forces. Explain to students that in this article Chief Joseph is telling a story. He introduces the story by discussing the way that the Nez Perce first encountered whites. He proceeds to give a history of the relationship between white settlers and the Nez Perce since first contact. The story Chief Joseph tells shows the rapid erosion of Nez Perce sovereignty in the 19th century. This story is not unique in the history of Indian/American relations. What is unusual is how wonderfully he shares his story with the American public. Inform students that they will be working in their teams to complete a project using information they gather over the first week. The student group’s task is to create a visual representation of Chief Joseph’s story using a story board format. After reading the provided article, they will design a storyboard outlining important historical events in Chief Joseph’s story related to his struggle to maintain his people’s sovereignty. Think of this as similar to creating a comic book, graphic novel, or anime. Students are telling Chief Joseph’s story through pictures. Some tribes completed similar pictorial histories, called Winter Counts, on animal hide canvases. Students should begin by reading An Indian’s View of Indian Affairs. The assigned reader should read the article aloud to their group, while the other members follow along with their own text. As the reader finishes each paragraph, it would be advisable for the group to summarize the information presented in the paragraph. This is a long selection and students need to remain engaged. You may also want to encourage students to use a pencil to circle words, passages, or phrases that they don’t understand or that need clarification. Reading this document will, most likely, take the remainder of a standard class period. Gauge whether students will need more time to read the selection and provide that time if needed on day three. Day three, four, and five: Reading for understanding – how was sovereignty denied to the Nez Perce people? Spend a few minutes at the beginning of the period discussing what students read the previous day. Ask students to locate phrases or terms that they did not understand and bring them forward. If other students can provide clarification then they should do so. If not, you as the instructor may need to help students understand or frame Chief Joseph’s words. Next there came a white officer (Governor Stevens), who invited all the Nez Percés to a treaty council. After the council was opened he made known his heart. He said there were a great many white people in our country, and many more would come; that he wanted the land marked out so that the Indians and white men could be separated. If they were to live in peace it was necessary, he said, that the Indians should have a country set apart for them, and in that country they must stay. My father, who represented his band, refused to have anything to do with the council, because he wished to be a free man. He claimed that no man owned any part of the earth, and a man could not sell what he did not own. 1. What is the main idea presented in this paragraph? 2. In this paragraph, what information concerns Nez Perce sovereignty? 3. What does this paragraph tell you about the relationship between the Nez Perce and the US government? Students can now summarize the information they have highlighted in “An Indian’s View of Indian Affairs” using the note taking matrix found here: An Indian View Paragraph Matrix.docx. This is a large and information rich article – the purpose of the matrix is to consolidate useful information into a single user-friendly guide. If your students have used other graphic organizers such as webbing, you may certainly use other organizational tools to pull information regarding Nez Perce sovereignty from the text. Students have now read a rich and complex telling of the Nez Perce story. Groups have explored the reading material seeking information that addresses the historic loss of sovereignty for the Nez Perce people, and have pulled that information out of the reading to be organized and synthesized. They are ready to move on. Ask students to look at their matrix of information gathered from Chief Joseph’s words. Looking carefully at their information, students should determine five to six pivotal points in Chief Joseph’s story where Nez Perce sovereignty was compromised paying special attention to the United States’ actions in creating treaties with the Nez Perce. Encourage students to draw from the beginning, middle, and end of Chief Joseph’s story in order to best illustrate the history of Nez Perce/US relations. Ask students to highlight, circle, or underline information they will use in their illustrations. Students should sketch out a series of five to six pictures, based on the information gathered, that they believe best illustrate the Nez Perce struggle to remain sovereign. Once students have done this, and received teacher approval, they should move on to creating their story board. It is up to you whether you wish to dictate the structure of their illustrations. You may wish to encourage diversity in student’s illustrations. Some may want to draw story panels like a comic book; others may want to be less formal. The important thing is that they and you are able to recognize their understanding of the material in their illustrations. Make sure you allow students ample time to complete this task. You may want to consider student presentations of their material to their classmates. This is yet another way for you to check for comprehension of materials. Completion of level two instruction leads easily into the completion of Level Three’s CBA materials for “Causes of Conflict”. Note: There are a number of outstanding, well researched online units available for exploring the meaning of treaties and their impact on Indian people. Many of those resources have been folded into this unit, but may be used on their own as well. Take time to explore the wealth of resources available to teachers of Social Studies online. Note that the WMLA has put out a similar set of curriculum for the 8th grade CBA “Constitutional Issues” found here: http://www.cvsd.org/documents/Learning_Teaching/CBA/materials/8grade/treatywalla.pdf. Present their research to their peers, teacher, and/or external panel. Use the link http://stories.washingtonhistory.org/treatytrail/treaties/whatis.htmto examine the use of treaties in the United States as a means of acquiring Indian lands and resources, with a specific focus on the Nez Perce. What is a treaty? How does the U.S. Constitution regard treaties? What did the government hope to achieve with the Indian treaties? How did the Nez Perce tribe react when their lands and important places were taken from them? Use the annotated resource links to explore maps, primary and secondary source documents, and various historical perspectives to explore the ways that US actions during the Treaty Era created conflict between the Nez Perce and the US government. Demonstrate understanding of the complicated relationship between the Nez Perce and US Government through completion of the Classroom Based Assessment “Causes of Conflict” found here: http://www.k12.wa.us/SocialStudies/CBAs/MiddleSchool/MiddleSchHistory-CausesOfConflict-CBA.pdf. Take time to explore the OSPI CBA page for “Causes of Conflict” Make copies of the provided rubric and graphic organizer and make yourself familiar with the materials on the OSPI site. If your students have not already completed Level 1 and Level 2 curriculum, they should read the Level 1 newsletter located here Chief Joseph Newsletter.docx to gain a basic understanding of the history of Nez Perce and US relations. Students should then use the resources below to explore the causes of conflict between the Nez Perce and the United States government regarding attempts to place the Nez Perce on reservation lands. Students should have a printed or digital copy of OSPI’s “Causes of Conflict” CBA and use the provided questions to create their presentation or paper. A link to OSPI’s CBA page is provided below. This map shows the trail taken by the Nez Perce in their retreat from the advancing US military forces. 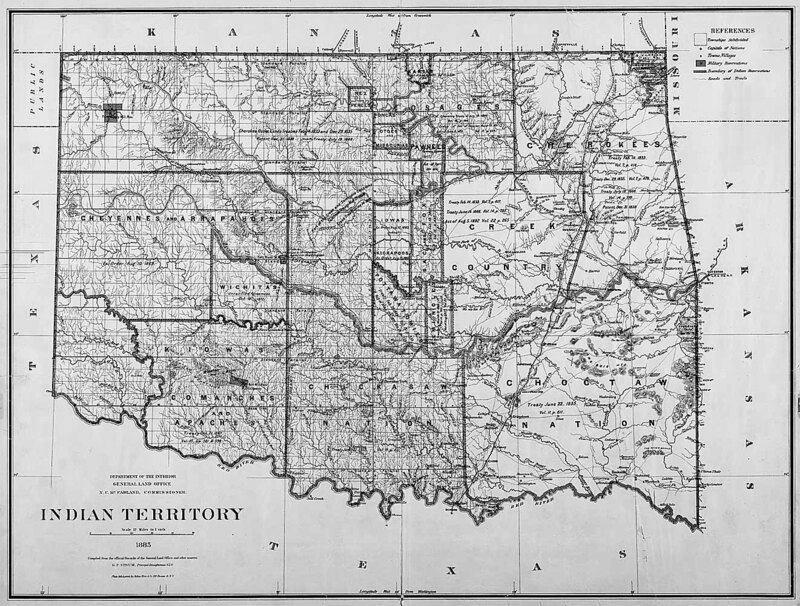 This map shows the boundaries of the Nez Perce reservation in Indian Territory (now Oklahoma) in 1885. This map shows the reduction in Nez Perce lands under the treaties of 1855 and 1863. Map of Indian territories in 1854, based on the Lambert census map. Map of Northwest reservations, including the Nez Perce, based on 1890 census data. Text of the Nez Perce treaty of 1855. Proclamation by the US government of the sale of land within the Nez Perce reservation to the US government. § Treaty between the United States of America and the Nez Perce Tribe of Indians. Concluded, June 9, 1863. Digital image of the arrival of the Nez Perce at the Walla Walla treaty council. Image of Chief Joseph and his family. OSPI’s graphic organizer, outline of the CBA writing process, and the grading rubric. Chief Joseph’s “An Indian’s View of Indian Affairs”. A narrative of Nez Perce history delivered by Chief Joseph two years after his surrender.